Info-Tech Research Group, Inc. Is a global leader in providing IT research and advice. ready-to-use tools and templates that cover the full spectrum of IT concerns. © 1997-2013 Info-Tech Research Group Inc.
operational maintenance role and eventually becoming obsolete. drive business improvement and innovation. to becoming the Chief Enterprise Integration Officer (CEIO). commitment to positioning yourself for success.  The CIO’s position is weakening. often filled by people with sufficient technical acumen to cause the organization to question the relevance of the CIO role. …AND continue to drive down costs.  The CIO needs a new agenda or he/she will end up as the Chief Technology Support Officer. solutions, as opposed to technology support, the CIO role will be severely devalued and will cease to exist within a few years. The Chief Technology Support Officer may survive, likely as the IT Director. Drive innovation, be the technology visionary, and support revenue generation. Manage IT like a business. Ensure information assets are adequately protected. Drive business insights through big data. 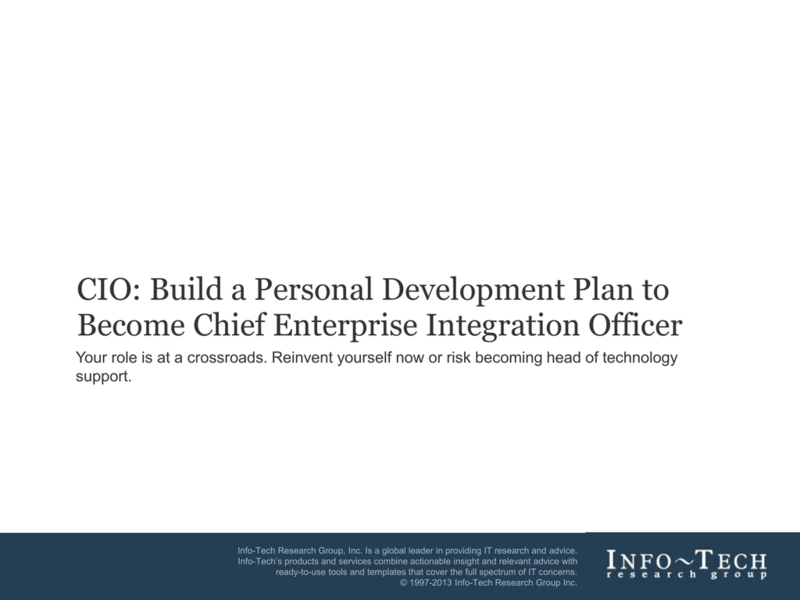  The CIO needs to reinvent the role as the Chief Enterprise Integration Officer. capability that you will need to not only remain relevant, but emerge as a key figure in your organization. innovation and integration throughout the enterprise. 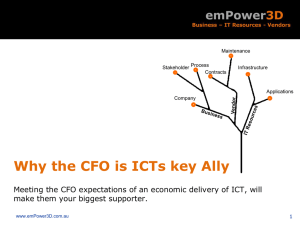 CEO, the CIO must adopt a new set of capabilities. the CIO’s position within the organization. the need for an IT department, let alone a CIO. Help position the organization in terms of brand equity. to exist within a few years. will likely to be absorbed into the cloud and the business. cease to exist – at least in its current form and shape. in the organization to generate, secure, and manage it. legacy applications that no one else wants to touch. processes out of cloud services. and assisting with mergers and acquisitions. • If you are a technology-centric CIO, not a business-centric CIO, you will have little to do in the organization in the future. all technology systems and solutions. support services to the organization. infrastructure to support the organization’s goals. • Develop and maintain the disaster recovery program. 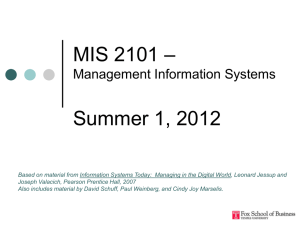 management of systems and operating hardware. business processes, and technology together across the enterprise. Understand the business and IT risks associated with it. seamless flow of information across the enterprise. Guide business prioritization and technology decisions. IT will no longer simply be a support function. IT will become part of and optimize core business processes. engineer: essential to the strategic growth of the firm. Focusing on highly innovative business engineering. revenue-generating functions will shift more into the focus of the CEIO. It is no longer simply cost that is the priority. needed to address these demands? Cloud necessitates a change in the IT operating model. The CEO expects more from the CIO. Consumerization and democratization of IT are disintegrating IT. Old and new roles are eroding the CIO’s importance. Business is demanding higher levels of integration. Drive innovation, be a technology visionary, and support revenue generation. stakeholders so you can prioritize accordingly. to address my competency gaps? building relationships with the key stakeholders identified in the Power Map Template. Create your CEIO Scorecard to focus on your goals and track your progress. How do I awaken the CEIO within me? interpret results, and plan next steps. 3. Compare your results with those of others. Benefit from lessons learned. clients and share what they learned. This bell signifies when you’ve reached an IAI point! results into a personalized action plan. 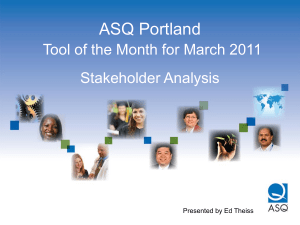 template, and assess the implications of your Stakeholder Power Map results. your completed template, and suggest strategies for developing/managing relationships. Personal Development Plan: Review your Personal Development Plan, suggest additional insights, and fill in any gaps. Check in regularly with an analyst to discuss progress and next steps. any gaps. Check in regularly with an analyst to discuss progress and next steps. • The history of the CIO. Rise of the CMO and other CXO Roles. The CIO role is quite confusing compared with the CEO or CFO. paired with the Chief Technology Officer. across the CEO, CFO, and COO portfolios. role, and that of the IT or MIS manager of old. which the role becomes a “chief” role. managers” other than in name. All parts of the in-house IT organization will be affected. Entering a new market can be done in hours. Launching a new product in minutes. Complex testing and development in mere days. options for businesses will grow exponentially. solutions, and vendors market directly to the business. pay using their own OPEX budget. end up in the cloud. adoption of the cloud before it is too late. new set of leadership capabilities from the CIO. to support your cloud-enabled organization – EnableIntegrate-Manage (E-I-M). • E-I-M facilitates a more business-focused approach. manage continue to meet the business’s requirements. the CEO in order to position him or herself as a business leader. separate department and cost center. efficiency – they will do it. of IT infrastructure and the business, and mitigating risk. lights on – that is, acting as the IT manger rather than the business partner. • The CIO needs to find a way to shift his/her responsibilities to the latter. invited to stick around, not the one harping on security or boring the CEO with tech talk. Communication around IT should function very much like IT itself. • Firefighting mode is never a good place to be for IT. partner that the business is looking for. adjustments to IT process, technology, and people. • IT priorities are aligned with business priorities, including: revenue growth, customer satisfaction, and innovation. • CIO understands the industry, including: customer behavior, supplier behavior, and strategic opportunities. offerings in the cloud or outsourced vendors. business and personal purposes over several years. incongruent data – due to a lack of integration across services. demonstration of value when pursuing technology-based initiatives. Technologist have been nibbling away at the CIO’s traditional space. networking and collaboration at a quicker pace than IT. low-risk subscription models gain popularity. to both the CMO and CIO. less important than understanding customer behavior. • Many CDOs are being positioned as strategic thinkers for emerging technologies. no, he implements technology-enabled innovation. More standardization in IT platforms and applications. More formalization of IT business processes. More centralization of decision making regarding IT. A higher rank of the top IT executive in the firm. connectivity enabled by the technology. overall benefit of the firm. – Support cross-business unit innovation. – Identify opportunities to create complementary services. – Achieve economies of scale and scope. • Five demands driving 11 new capabilities. are needed to address these demands. Mapping Tool to determine and prioritize your competency gaps. that capability to your organization. you see the tool icon again. Assessment, and determine next steps. your organization, talk to your colleagues. operational tasks are shifted to the Cloud. must demonstrate value creation for the business. wherever possible to create competitive advantage. problems reactively or only innovate within IT. • Demonstrate the tangible benefits of IT innovating with the business. • The right tools can significantly reduce time to production or market. accessible, and accurate data will empower decision makers. • Reducing time or resources necessary to execute processes. For more information see Info-Tech’s Institutionalize Innovation Through IT. make the right technology decisions and drive business revenue. models and better use of data. 3. The current level of competence you bring to the CEIO role. solutions to create a self-funding model for investing in new capabilities. money in, such as what the company is doing with IT, and what customers are doing with IT. be able to quickly deliver the services required by the business. defining the organizational strategy for working in a cloud-based world. and portfolio management in order to adequately oversee the variety of external services. cost management across the enterprise. as a revenue-generating entity within the enterprise, thereby helping IT to create value for the organization. consolidations within the IT team. As more cloud services are procured, the CIO needs to ensure enterprisewide integration to achieve organizational efficiencies. • The requirement to collect and analyze big data is perhaps the largest driver of this need. Optimize processes across the organization to deliver efficiencies and facilitate innovation. more advanced today than ever before. A higher level of defense. Take charge of disaster recovery plans from a global perspective. security, since technology generally underlies physical security systems. the CEIO must have strong Information Protection capabilities. perspectives have taken precedence over technical skills. organization, especially if they have project management skills. relevant in two or three years. Develop the skills that will give you staying power. they work in and the organization’s business model. that are meaningful to everyone in the organization. Leadership & Influence (Rows 13-15). 1. The level of importance of this capability to your organization. organizations wishing to utilize real-time decision making. Information generated by social media interactions. intelligence strategy to meet these expectations. systems and infrastructure to support trends like big data. business capabilities to see how you stack up. description for Data Stewardship (Row 16). You have now reached the end of the CEIO Capability Assessment Tool. competency gap and the importance to your organization. capabilities required by your organization. to the Chief Support Officer. • The importance of stakeholder management. determine who you need on your side. threaten their relevance or build their reputation. increase, this relationship is key for the CIO. are with the Finance and Operations executives. threaten their very existence, for example, the CMO. service – will be critical to the CIO’s success. technology focus is a natural fit. at the expense of those that are more strategic. lose or win as a result of your success or failure. have the power either to benefit or block your progress. Internal includes your boss, peers, and staff. initiative for which they are being evaluated. Focusing on managing those that are less critical. preparing a strategy to manage them to your advantage. importance of key stakeholders and assess your relationship with them. over your position in the organization? • Impact: How will your actions affect this stakeholder? • Support: How strong is this stakeholder’s support for you? one stakeholder to another to signify this relationship. template and to assess the implications for your results. are featured on the map. engage with to ensure your success and your future at the organization. CIOs more quickly thanks to the cloud. more readily for their use. • The CEIO job description. enabling the expansion of the business compared with IT operations. • Keep the lights on. • Keep the business running. they have to go hand-in-hand. 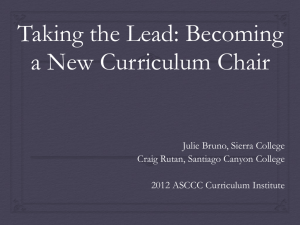 develop and review strategies and initiatives. the context of risk and benefits. the health of the company. necessary to be a CEIO. balanced with strong managerial skills. Digital consumer technologies of all sorts. Sensors used in all kinds of smart solutions. Digital voice and video communications. chain will depend on IT to a great extent. will optimize, the core business processes. taken seriously by their IT staff. appreciates the challenges inherent in the work. • Create your Stakeholder Management Strategy. • Create your Personal Development Plan. • Create your Balanced Scorecard. and inﬂuence people far more important. further into detractors and supporters. the degree of support you need. will engage with them to help position you for success. cloud-based customer relationship management tool. Build the business case and make the recommendation. Impact of your actions on the stakeholder. Map Template to assess the key stakeholders. suggest tactics for relationship development. top in terms of skill and insight. Source: Andy Parkins, VP, Business Technology, 1-800-GOTJUNK? achieving all that he could as VP. will be undertaken to address the competency gaps. technology may deliver to meet those needs. business instead of being led around by it. your PDP evolves as you grow in your career. building up a solid track record. how you can influence it. 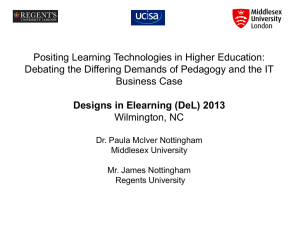 create a holistic and stimulating PDP.  Participation in dialogs with other innovators (possibly facilitated by Info-Tech).  Readings on innovation (e.g. The Innovator's DNA).  Conferences on innovation (e.g. Unleashing Innovation). Wants You to Know: Building Business Acumen . skillset necessary to be a better.  Take a course (e.g. Course description: IBM Enterprise Architecture Boot Camp - 10 days). Architecture -- The Missing Ingredient for CIO Success?.  Training in APM: APM120 – Application Portfolio Management 9.14 Essentials.  Engage a consulting firm to do an APM exercise.  Read interesting articles like this: The Value Chain for Enterprise Investment.  Review research on vendors and their products.  Engage Info-Tech to do a workshop for your team on vendor selection and management.  Read articles about COBIT and ITIL. risk management guides for CIOs.  Follow blogs, e.g. Top 20 Security Blogs.  Take a course, e.g. Information Security: CIE Course Module 5. As mentioned previously, ask the CEO to let you run a small business unit. Volunteer for the board of a charitable organization. Get your MBA or take an executive development course through a university. Take training: IT Alignment: CIE Course Module 3. Pay attention to what’s going on around you in executive meetings. Volunteer to do assignments above and beyond IT (e.g. due diligence on acquisitions). Read widely on the subject (e.g. subscribe to HBR, The Economist, Forbes). management: Advanced Stakeholder Management . Management  Read blogs and other articles (e.g. Stakeholder Management's Blog).  Book a stakeholder management workshop with Info-Tech for you and your team. Goleman, Robert Kegan and Lisa Lahey.  Engage an executive coach.  Read academic studies like this one: Lessons from an Information Technology.  Have a look at the Data Governance Institute and The Data Manager’s Public Library.  Book a workshop on data stewardship with Info-Tech or an AIS call. pulse of the tech world. Make sure that you know the goals of the business unit. business unit to achieve its goals. Do a “quick and dirty” cost-benefit analysis. A cloud solution that will reduce costs or provide new capability for HR. resolve issues and generate efficiencies. Selling digital information about your products/services to your industry. Creating a subscription service for a product or service. things are not done in a vacuum. tools in their day-to-day work. steps to closing competency gaps. explanatory text in dark grey before finalizing the document. determine and prioritize competency gaps. in regularly to discuss progress and next steps. CEIO PDP you might have. to move forward with your plan. Outline of competency gaps and their size. completion and measurement of achievement. • 100-day plan to demonstrate results quickly. organization by monitoring performance against strategic goals. The CEIO Capabilities Scorecard will help you measure your progress. 2. Define the four Perspectives for your balanced scorecard. 4. 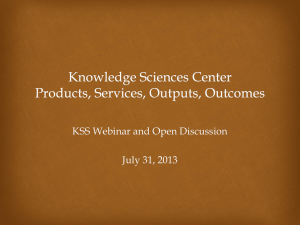 Define Key Performance Indicators (KPI) for each Factor. 5. Identify Benchmarks or Targets for each KPI. targets, suggest additional insights, or fill in any gaps. • Your CEIO Personal Development Plan. Capability Development, Strategy, and Leadership. it validated through an IAI. Prepare for the new demands on the CIO. Enterprise Integration Officer, or face being relegated to the Chief Technology Support Officer role. are positioned to address those needs. • Assess your organization’s requirements for the new capabilities discussed within. • Assess your personal competency level for the capabilities. relationships with revenue-generating department heads such as marketing and sales executives. Short-term (100 day plan which would include identifying a pilot project). Mid-term (three to nine months). Long-term (greater than nine months). CEIOs must commit to their success by tracking their progress towards their goals. 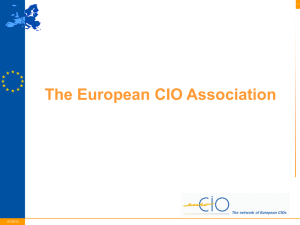 2013 Survey of the State of the CIO. CIO Magazine, January 2013. Connolly, B. How the CIO came to be. 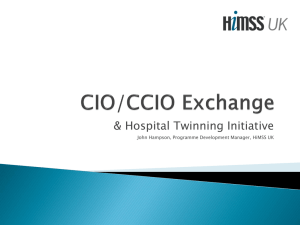 CIO New Zealand, January 25, 2013. The DNA of the CIO: Opening the Door to the C-Suite. Ernst & Young, 2012. Engelbert, K. Will CIOs Vanish Into The Cloud? Forbes: CIO Network, April 18, 2012. Feldman, J. CIOs As Rainmakers: The New Meme, Deconstructed. Information Week: Global CIO, December 6, 2012. Hinssen, P. Will the real CIO please stand up? LinkedIn, March 7, 2013. HP Enterprise 20/20: Volume 1 – Chapter 1 CIO 20/20. Kretzman, P. IT Consumerization, the Cloud and the Alleged Death of the CIO. Wired, March 16, 2012. Lai, E. Your CMO May Be Your New CIO (And What That Means For Enterprise Mobility). ZDNet, October 25, 2012. Melymuka, K. Evolution of the IT Leader. Computerworld, September 30, 2012. Nash, K. More CIOs Are Gaining Stature As Business Strategists. CIO.com, January , 2013. Potts, C. The FruITion Papers. Dominic Barrow Services Limited, 2007-2008. The VP of electricity did not disappear because electricity disappeared. watch-the-wave.com, January, 2011. 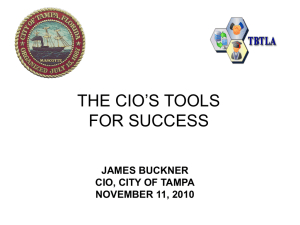 • Understand the key requirements of the CIO role. • Undertake a personal development plan to address competency gaps. advice to your specific organizational needs. 2. Complete a critical project stage with a Consulting Analyst. complete a Tool or Template, interpret results, and plan next steps. experiences of other clients and share what they learned. 3. Your personal competency level (Column J). importance of that capability to your organization. personal competency level for each capability. ◦ Could or should have an interest in what you are trying to achieve. ◦ Stands to lose or win as a result of your success or failure. ◦ Stakeholders can be both external or internal to the organization. • Why do we care about stakeholders? ◦ Because they will have the power either to benefit or block your progress. – Focusing on managing those that are less critical. – Ignoring crucial influences that could either hinder or assist your success. • His or her power/influence (Low to High). • His or her support for you (Low to High). stakeholders and track actions taken. ◦ Documents the goals and competency gaps. opportunities present themselves and goals change. performance of the business and how you can influence it. in dark grey before finalizing the document. 3. Identify Objectives for each Perspective. 6. Identify Benchmarks or Targets for each KPI. survey is a leading indicator. Employee turnover is a lagging indicator. implications of your Stakeholder Power Map results. suggest strategies for developing/managing relationships. analyst to discuss progress and next steps. with an analyst to discuss progress and next steps.